Don’t let your ministry to those precious children and their families end on Friday! Once Vacation Bible School has ended now you have the privilege of following up with those families whose children attended your VBS, and who do not normally attend your church. For most churches, it is the largest outreach opportunity they will have all year. Below are just a few suggestions. Have a huge visitation blitz, and enlist staff and lay leaders to make a personal visit to every family whose child visited during VBS, if they are not members of anything else at your church or if the parents are not members. Make this a front-porch style visit, just to thank them for letting their child attend VBS. Take the opportunity to give them a gift bag from your church containing brochures or more information in some format. You might be pleasantly surprised at the response you get! Search Builder is the tool to use to find those who fit the criteria you choose. Once you find them, you could print the Inreach Outreach Report with Form and pass those out to your volunteers you are making the visits. Instruct the volunteers to complete the form portion based on the results of their visits, and return the forms to the church. At that point, a staff member can enter those visits as Contacts . If you start the day with donuts, coffee and a pep talk (maybe while a video montage of VBS is playing in the background! ), it will be great fun and very rewarding. After the forms are turned in, be sure to have someone (or several someones!) enter those results as Contacts. This is valuable information you will want in your TouchPoint database. Make the value greater than 0 for the program in which your VBS classes are located. Select date range for the days you had VBS. This will find everyone who attended, whether they enrolled in VBS organization or just visited any time during the week. Set the value as False. This finds those children who parents are not church members. This is why we do not put neighbors’ children in the same family with the person that brought them. They need to be in their own family. Set the value to equal False. This would eliminate those who are enrolled in a Main Fellowship type of organization. 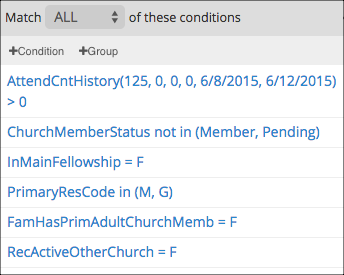 If you church uses Resident Codes, you can select is ‘one of’ Metro or Marginal. This focuses on children with local addresses. We get a lot of children visiting from out of town, who pick that week to stay with their grandparents just so they can attend VBS. We obviously do not try to make out of town visits! If your church is not using Resident Codes, you can use the condition Zip starts with and use part of your local zip code. If you want to narrow the search further, you could add this condition (if you asked this specific question during your online registration) and set the value to False. This would return just those children who indicated that they do not attend church elsewhere. Use a search similar to the one described above, and email everyone, including in your email a special video message from your children’s ministry (or your pastor) with clips/pictures from VBS and an invitation to come back on Sunday. Be sure to tell them what to expect when they arrive on Sunday - where to enter the building, where the check-in stations are located, and any other information that will help them feel more comfortable when they arrive. Depending on how many people you have that need follow-up contacts, you might want to run a similar search and assign Tasks to your staff or lay leaders to make phone calls or visits. When you do this, the person assigned the task will complete the Contact form when they mark the Task complete. This will give you some great information to help evaluate any prospects. There are tons of ways to do follow-up after a big event. Decide what works best for your church and do it using TouchPoint to help.